RETIRE IN STYLE BLOG: Headline (paraphrase): "OLD PEOPLE STILL ABLE TO LEARN!" Successful Aging Survey. Headline (paraphrase): "OLD PEOPLE STILL ABLE TO LEARN!" Successful Aging Survey. Grandmother and Grandson...both still learning and growing! They said "You are not old...you are just very, very wise!" I am all about aging successfully. When I talk about "success" in this context, I am not talking about the absence of health problems or financial success. Successful aging, in my world, happens in the 6 inches between you ears. So when I came across an article telling us that indeed, old people are aging successfully, I thought it was wonderful. The story, Researchers: Seniors can Learn New Skills Despite Growing Age in Top News out of the UK was a review of a talk given by Dilip Jeste, MD. ...the reality that elderly people are sluggish in reacting compared to younger people, is extensively observed as a shortcoming. But, that's not the case all the time. Dilip said, "The elderly brain is less dopamine-dependent, making people less impulsive and controlled by emotion. Older people also less likely to respond thoughtlessly to negative emotional stimuli because their brains have slowed down compared to younger people”. The Royal College of Psychiatrists Congress in Edinburgh was told that this in real meaning, is wisdom. This short piece whetted my appetite for more information. I went on to find the following information. There is not much information on aging successfully. Most articles focus as all those negative maladies. Because of all the negative information promoted in most material, research writers and the new media have not focused on aging successfully. People that see themselves as aging successfully do so because they are able to remain mentally active. Illness does not affect their perception. Not everyone is resilient and can recover from changes in their lives. However, this is not necessarily because of good genes. Good attitude and healthy life choices account for 50% of a persons ability to adapt to changes related to aging. Studies have shown that the brain of old people continues to grown and develop. Those that put their minds to good use age more successfully. It turns out that exercise is good for the mind as well as our emotional well being. Did you already know this or at least thought it was possible? I actually have believed this for a long time. I would encourage you to go to both articles, follow all the links and research. Tell me what you think. 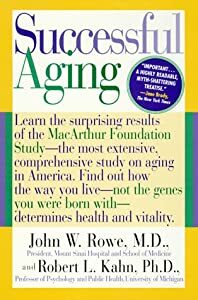 Are we aging successfully? I think the answer has to be a resounding "yes"!